Is St Lucia the new Jamaica? At the beginning of July the St Lucia Tourism Authority announced to the world that the island had been accepted into an exclusive portfolio of holiday destinations favours by Virtuoso, the luxury travel advisers. Next week, for the first time ever, St Lucia is participating in Virtuoso Travel Week 2018, a travel industry event taking place in Las Vegas, Nevada. But as St Lucia seeks to become a more mainstream destination, it’s important to keep in mind that it shares more in common with its neighbours than just soft sands and sunny skies. 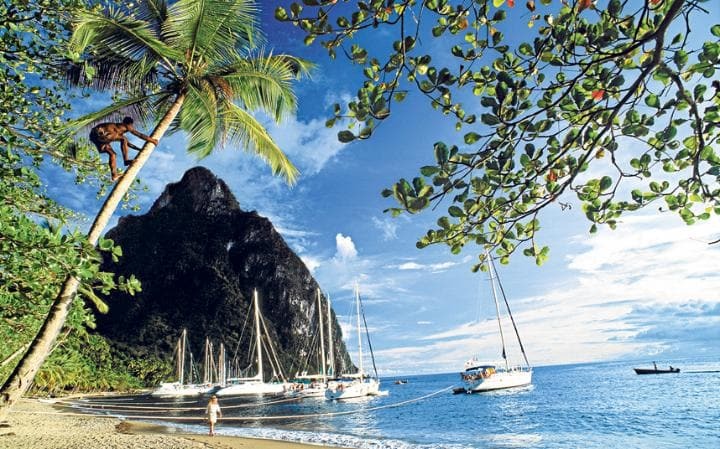 St Lucia has long been touted as the hidden gem of Caribbean holiday destinations. The staggering beauty of its landscape, the Piton Mountains, tropical rain forests and secluded bays regularly puts it on listicles as a hidden piece of paradise. Now, the St Lucia Tourism Board has been successful in broadening the appeal of the Island beyond newlyweds, with unique attractions like the Jazz Festival and drive-in Volcano providing more opportunity to a wider variety of tourists. Although while the dangers of vacationing in countries like Jamaica is common knowledge, the sun soaked destination of St Lucia is no utopia. Just like Jamaica, it has an overstretched and under resourced justice system that has allowed gangs to gain a foothold and threaten the stability of St Lucia’s tourism industry. While locals of both islands are much more likely to fall victim to violent crime, there’s an eerie similarity between murder cases involving overseas visitors and on ongoing underlying threat to tourists. Headlines were made earlier this year when recently retired grandparents Charlie and Gayle Anderson were murdered at their home in Jamaica. Authorities believe they were deliberately targeted, probably because they were perceived to have wealth, just like the ‘yachties’ commonly visiting St Lucia. There are also striking parallels with the murder of Elias Louisy, the 73 year old British retiree who was critically injured in a machete attack at his home close to Vieux Fort. His wife, Muriel, was hospitalised in the same attack. The awareness of the Jamaican government’s failure to stem the tide of murders is much more in the public eye primarily due to the state of public emergency applied to the Parish of St James in January. Also, the raw figures are lopsided as Jamaica's population is more the 16 times that of St Lucia. However, the homicide rate per capita of both countries is enough to push them into the ninetieth percentile of most dangerous destinations. Authorities on both islands blame gang activity for the high rates of murder and gun crime. The carnage of crime sees countless young lives wasted and families devastated, and all too frequently innocent bystanders get caught up in the attacks. The cultures of crime on both islands that permit gangland turf wars to run amok, also contributes to epidemic levels of robberies and violent attacks on tourists. This prevalence of gangland violence creates huge problems for delivering justice for anyone. Police forces on both islands are overwhelmed, there are unsolved cases going back decades that there simply isn’t the resource to investigate many of them properly. The court systems are clogged up, so even the most cut and dry cases can take years to come to fruition. Justice delayed is justice denied, it leads to greater mistrust of the justice system and does nothing for the rehabilitation of offenders. This contributes to the spiral of decline that requires a major systemic intervention to address. We don’t want you to disregard St Lucia as a holiday destination, but we do want to give you the full and frankly realistic picture. Just like Jamaica, terrible things happen to tourists with alarming regularity in St Lucia and the authorities on the island are struggling to deal with it. Only through sustained pressure will the authorities make the investments and improvements necessary for its justice system to halt the island’s spiral of decline and ensure justice is done in a timely way for all victims of crime. It’s only through these improvements that holidaymakers will develop confidence to visit and invest in a country with so much beauty and so much to offer. you know its quite amazing what some people would find themselves doing with their free time. instead of being malicious why don't you continue seeking assistance for the justice you so desire from the St Lucian people ? Do you believe Majority of us are in cahoots with criminals and will cover up for them or we condone any form of criminal activity ? i mean common, the Reality is that we live in a world filled with people, some good some bad, as such you cannot come to St Lucia and be careless with your lives and day to day activities , go where ever you want and at any time without taking precaution and feel like the whole island let you down when something terrible happens like what happen to the victim, you his wife, his family and loved ones. We sympathize with you and believe me we the majority would never be happy or condone the actions of a few idiots the minority who look to commit crimes, but you are deliberately trying to tarnish the reputation of an island so dependent on tourism even going as far as to ask for tourist to boycott St Lucia ? What do you intend to gain and achieve by doing so ? Will this bring Roger Pratt Back to you ? Do you know that St Lucian people (civilians ) have come to the aid of tourist who have found themselves in situations where criminals tried to rob or take advantage of them? Crime Occurs any where in the world even in Britain, should i refresh your memory of past incidents? You truly need to stop what you are doing, Cuz this is rather unfair, St Lucia is not immune to violence just as no where in this world is. What happened to your husband , friend or Family member was really unfortunate but enough with this blatant name calling and character assassination of our Island and it's People. If you need to reassure your self of the crimes happening around you, in your country or the rest of the world, pick up the news papers at home , watch the television , go on to websites, search online and i guarantee that you will find there are far more worst places to visit than St Lucia . you need to take this post down, close this website cuz you're not helping your cause, get in contact with the British high commissioner, explain this situation and i'm sure he will do whats required to help bring this matter to a close along with the prime minister and the people of St Lucia. Look i just offered you some advice and assistance if we are such monsters and terrible people as you claim, why would you get this advice? Gangster's paradise would not be interested in helping you out, so why would i just now look to assist you.